If you want to know how to sleep better at night naturally, try this. Stick to a sleep schedule. With all the necessary preparation for guests, it’s easy to stay up late cleaning or making pies. But losing even one hour of sleep a few nights in a row can throw off your body clock for many days. Go to bed at a decent time every night — even on weekends — so you’ll be ready to greet friends and family with bright eyes! Follow a relaxing bedtime routine. There’s certainly a lot to worry about when expecting a lot of people over, but taking that stress to bed with you can make it impossible to fall asleep. Try taking a hot shower or bath before bed and don’t work in bed or check social media for an hour before you need to fall asleep (seeing everyone else’s beautiful decor will just make you anxious!). Instead, pick up a funny book and let all your worries slip away before drifting into dreamland. Get daily exercise. If you want to know how to get better sleep, talk to someone who is religious about their workout routine. Regular exercise early in the day helps facilitate a natural sleep/wake cycle because it raises body temperature, then allows body temperature to drop a few hours later — which naturally triggers sleepiness. If you usually do exercise but have missed a few workouts because you’re preparing for the holidays, you’ll definitely be able to tell the difference in the quality of your sleep, so get back on track and make exercise a priority — clean carpets or pumpkin pie can wait until after your workout! Make changes to your sleep environment. One of the most important sleeping tips is to design your bedroom to help you fall asleep and stay asleep. The best temperature for your bedroom is 65-67 degrees to keep you from getting overheated, and there should be no light streaming in or noises that can wake you up. If your room is near a busy street, use a white noise machine to block out sound, and if it’s too bright due to street lights, hang blackout curtains. Don’t taste test right before bed. Heavy foods can be hard to digest when you’re lying down, so if you want to make sure your new recipe is perfect, try it at least an hour before bed to avoid waking up with heartburn. Over 80 years of comfort research. Our family has been in the mattress business for many, many years, and we’ve listened to every customer along the way to perfect the most pressure-relieving, supportive mattresses possible. Handmade quality. We still make each mattress just as we always have — by sewing each one by hand. Each member of our team uses incredible precision to craft durable mattresses made with the highest quality foams, springs, and fabrics all made right here in America. A bed for every body type. Whether you’re a stomach sleeper, a back sleeper, or a side sleeper, we have a mattress with just the right combination of contouring support. Our mattresses relieve pain and help you get the deep, rejuvenating sleep you need to feel your best. Prices you won’t lose sleep over. A mattress is a huge investment, but you don’t have to feel guilty about splurging on one of our luxurious handmade beds. Because we build our mattresses and sell them straight to you, we don’t have to pay a middle man or abide by any manufacturer pricing rules. We choose to offer our quality beds at prices the average consumer can afford, because we believe everyone deserves great sleep. 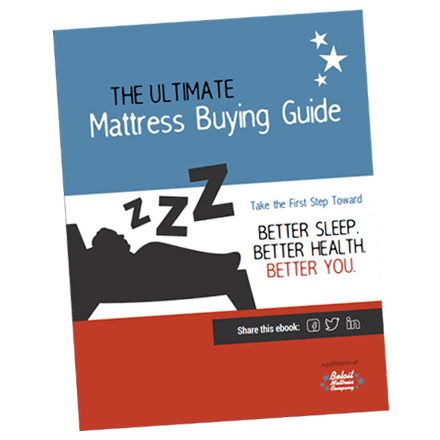 Not Sure Which Mattress is Right for You? Try Our Mattress Matcher! Whether you prefer latex, memory foam, or innerspring mattresses, you’ll find a mattress at Beloit Mattress Company to fit your budget. Our Mattress Matcher product advisor tool can help you choose the perfect mattress for your sleeping position that will help you get the best sleep possible so you can enjoy this holiday season to the fullest!